Emmett and I reserved today as Pickling/Canning/General Preservation day — little did we know that we’d find ourselves pickling late into the night! It’s 11 p.m., and the last jars of applesauce are finally filled and sealed — but still boiling away on the stove. I’m intrigued, though, to find out how the cherry tomatoes will turn out. The recipe called for basil, which will be, um, interesting paired with apple cider vinegar. It could be really tasty, or it could be utterly horrendous. Only time will tell. In other bizarre pickling news, something strange happened to our Dilly Beans this time around: they shriveled. 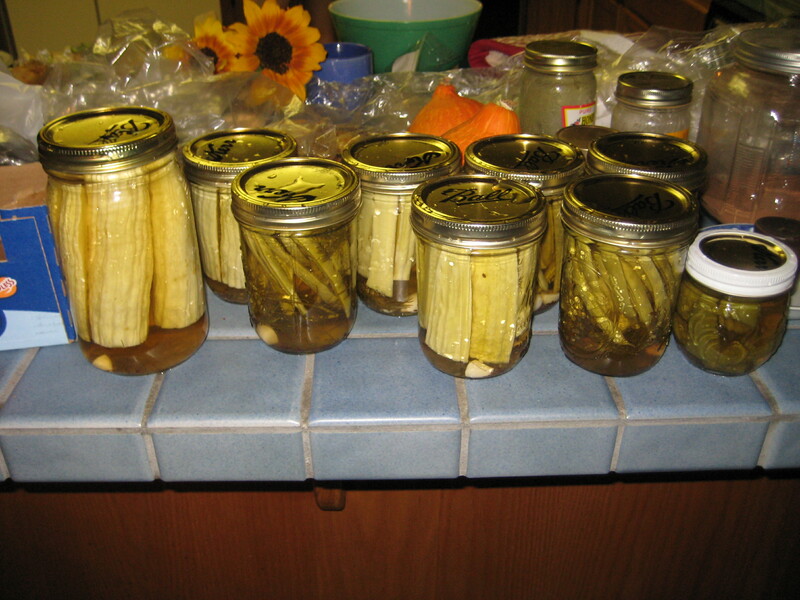 The skin looks wrinkly now, and every single bean jar ended up a “floater,” despite the fact that we packed them very tightly. (One of the books suggested using sterilized pebbles to weight pickles down — maybe next time I’ll have to try that.) I wonder if it’s because these beans weren’t fresh-picked today; they were a few days old. I’ll have to taste-test tomorrow, and see if they taste better than they look… I also wonder how they’ll keep; they all sealed, but they’re definitely poking up into the ‘headspace’ (air part) of the jar. In bizarre non-pickling news, our chicks have turned into little cannibals. Well, kind of. Maybe it was getting too crowded in the brooder: they started pecking at one another. This morning, I noticed one Rhode Island Red who’d been pecked — a small patch bare of feathers on her back, with some irritated-looking skin showing — so I put her in a separate cage with Runt (one of my favorite chicks) for company. Emmett and I went out for a couple of hours to water and harvest, and when we came back, several more chicks had gotten the same treatment. Two were actually bleeding; one had a rather nasty-looking open wound, and even Nurse Runt seemed to want to peck it. Now the wounded one’s in solitary confinement with some Neosporin on her back. Hopefully she’ll be okay. 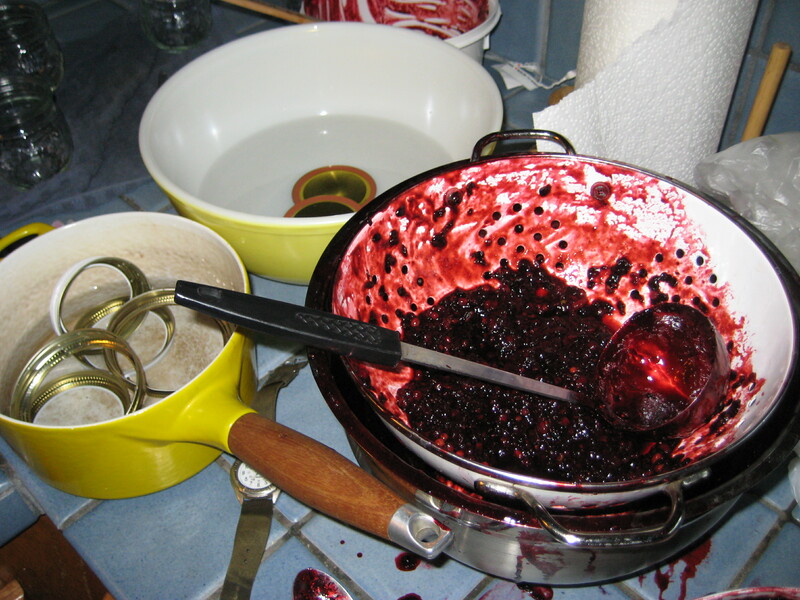 mmmm… smushed blackberries… we strained out some of the chunks to make the jam a little smoother, and used the leftover chunks for blackberry crisp. 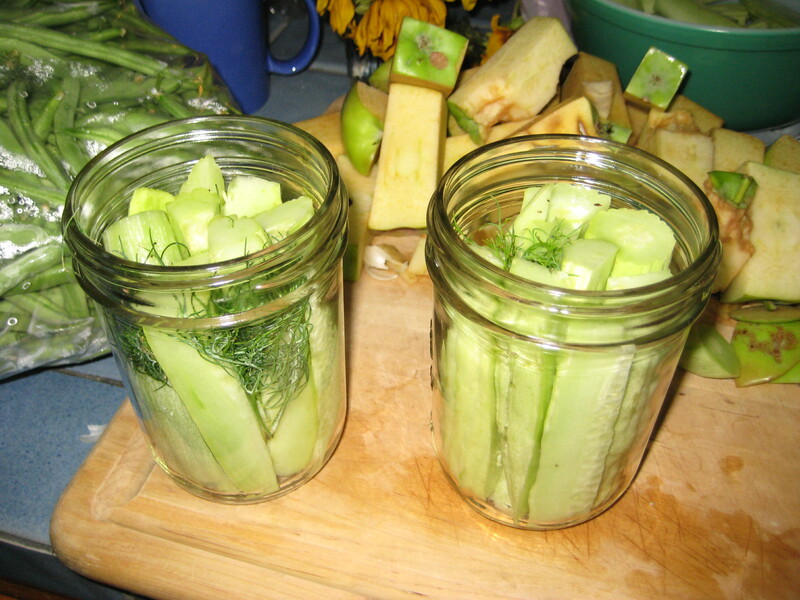 cucumber pickles cooling, post-processing, in a chilled water bath — no room on the counter, so they went on the floor. cooling them down more quickly allegedly keeps them more crisp. also, think we picked enough apples? I got a little carried away. half a bag yielded one full soup-pot of sauce (about 4 quarts). 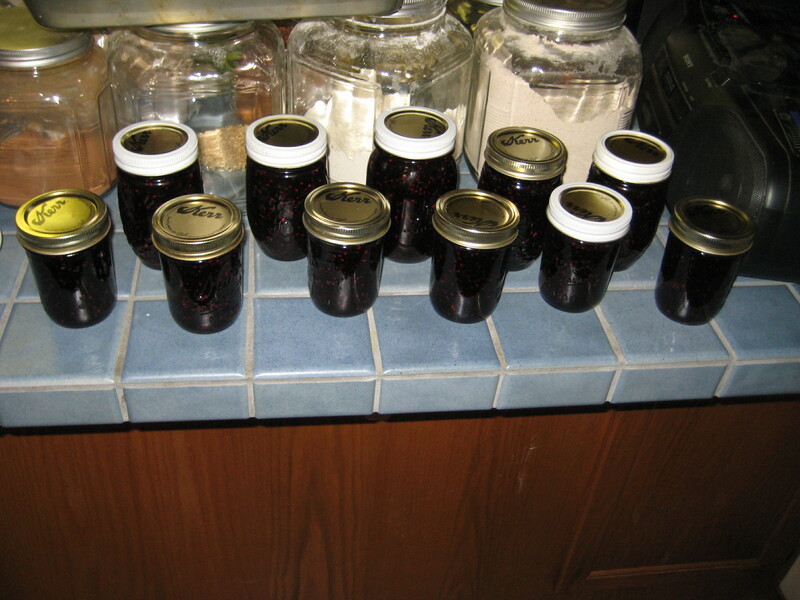 blackberry jam! 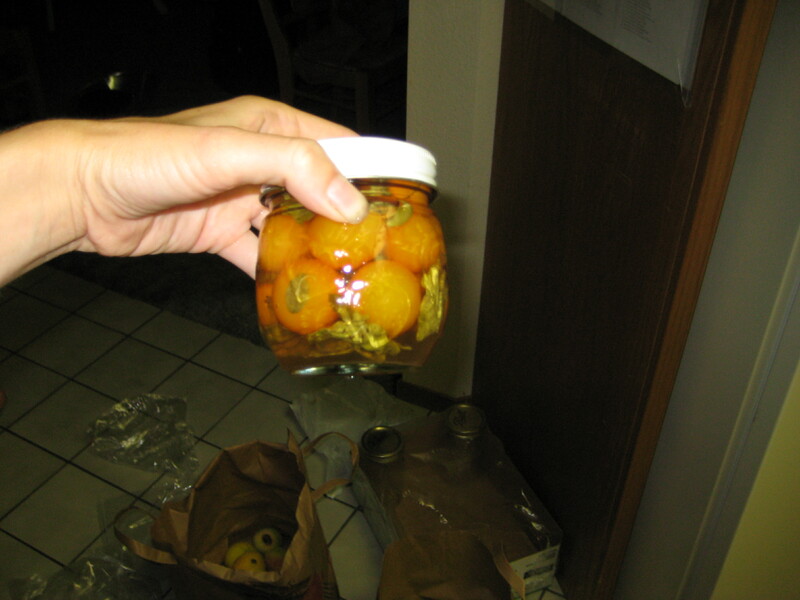 we just follow the recipe on the pectin box — easy as pie. except really, pie’s harder. 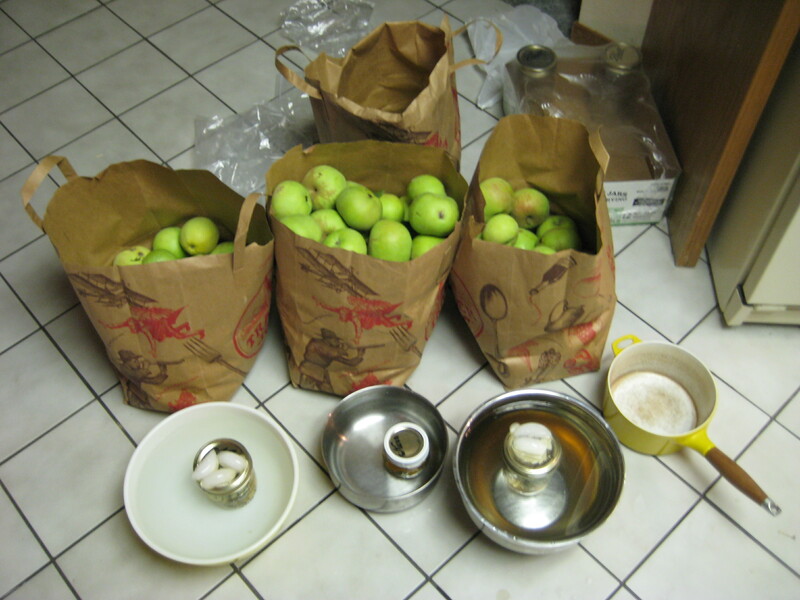 the last batch of the day (errr, night)… applesauce!